Offers: Some 'Stay & Play' discount golf offers. Eagleton Golf resort offers full country club leisure facilities. The centrepiece is the 7,100 yard, Par 72, Championship golf course designed by Pacific Coast Designs of Australia. Built to PGA standards and always well maintained, the design uses the natural terrain to deliver wide, rolling tree lined fairways which lead to huge undulating greens. The integration of water hazards and strategically placed bunkers means this course is capable of proving a challenge to even the best of golfers. However, the variety of tee positions means the course can also be enjoyed by less accomplished golfers. 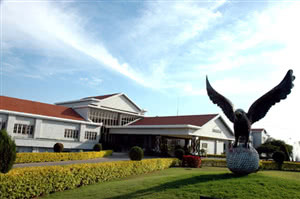 the quality of the course is reflected in the fact that it was the first course in India to host a Ladies european Tour Event and was voted 'Best Golf Course in India' by Asia Pacific Golf Summint 2009.